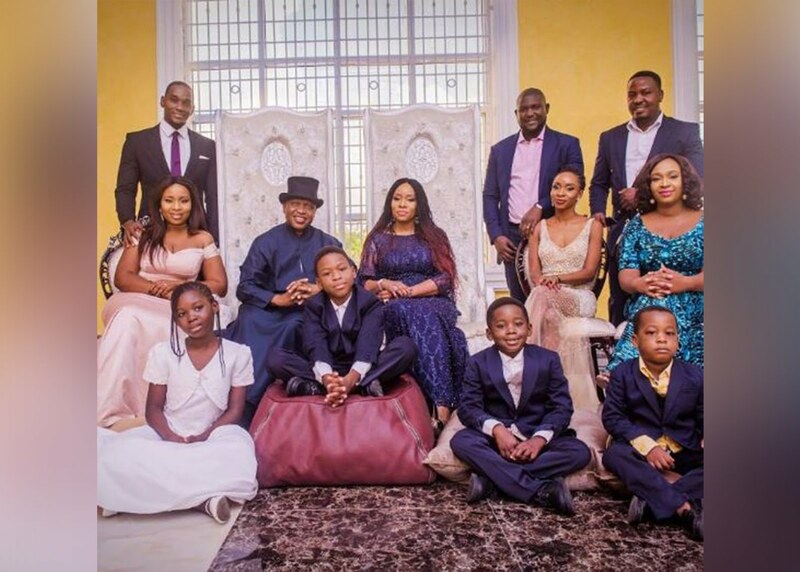 Okay guys, I was able to come across this cute picture of the Emerhor's, am not sure if there is another blogger who have this anyway lol but I guess aunty Ufuoma, who is the daughter and also a christian Blogger got it because I picked it from her. Olorogun O'tega Emerhor, OON is currently the Chief Executive Officer of the Standard Alliance Group. Born November 25, 1957 in Evwreni, Ughelli North Local Government Area of Delta State. He is a fellow of the institute of chartered accountants, a banker, an insurance guru and a tested turnaround expert, manager of men and resources. Olorogun O'tega Emerhor had his early Education at Ewu Grammar School, Ewu in Delta State between 1975 and 1979 Studied Accountancy at the University of Nigeria, Nsukka where he graduated with a first class honour degree in Accountancy in 1983. He clinched most of the prizes in the Department of Accountancy and Faculty of Business Administration. He received the Faculty Prize for Best Final Year Student; Lever Brothers' Prize for Best Graduating Student; Dr. C.C. Abebe Prize for Best Final Year Student; Sir Odumegwu Ojukwu's Prize for Best Degree Programme Final Year Student in Business Administration, amongst others. As a Federal Government scholar, Emerhor qualified as a Chartered Accountant in 1986, after training with the prestigious firm, Price Waterhouse Coopers. Successful stints at Citibank Nigeria ( then NIB ), Fidelity Bank, Guaranty Trust Bank and Crystal Bank Plc. (later Standard Trust Bank, now UBA Plc.) where he served as pioneer MD/CEO until July 1995. Chairman of First Atlantic Bank Plc. in 1998, after he led a group of investors to take over the then ailing Comet Merchant Bank. He was the Vice Chairman of the bank which was later renamed First Inland Bank Plc. before he left the board in 2012. As key player in the financial services market. He is a recipient of the national honour, Officer of the Order of the Niger (OON), and a holder of the prestigious Dr. Kwame Nkrumah Leadership Award and also the Midwest Personality of Year 2002, among several other awards. He is a front-line member of African Business Leadership Forum; Fellow, Institute of Credit and Risk Management of Nigeria; Fellow, Academy for Entrepreneurial Studies and Member, Institute of Marketing Consultants, among others. Olorogun O'tega Emerhor chairs the boards of Transcorp Hilton, Abuja; Transcorp Metropolitan Calabar, Heroes Furniture Group among others. He is also a director in numerous companies including Suntrust Oil Ltd; and a former Vice President of the Nigerian Chamber of Shipping. Chairman and Founder of Fair Life Africa Foundation, a non-profit, non-governmental organization based in Lagos, Nigeria whose primary objective is to take children off the street, unite them with their families and provide these children access to education. Fair Life Africa Foundation’s other objectives are to enrich the lives of the most impoverished in society; support and empower the most vulnerable members of society, enabling them to live a fair life; and effect positive changes in their lives through social initiatives and programs. Provision of scholarship to indigent students in his locality and follow up employment and career assistance after graduate. Regular empowerment and support for widows. Provision of food packages to the underprivileged. Chairman of the Urhobo Progress Union (UPU) Special Fund Management Board instituted to raise funds for the development of Urhobo nation. Olorogun Emerhor has since then, been working with other leaders across Delta state, who built the APC into a strong and viable party poised to claim the governorship seat in the Delta State Nigeria.